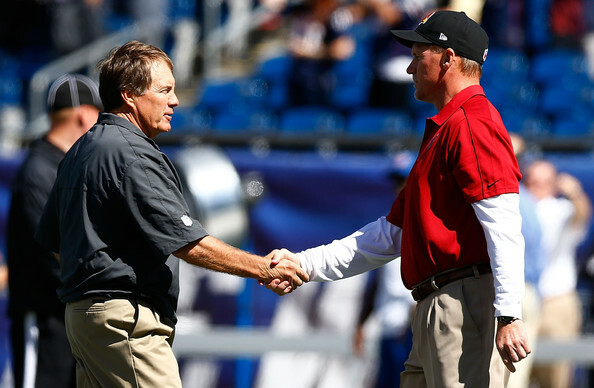 New England Patriots 18-20 Arizona Cardinals - Was Bill Belichick Outcoached by Ken Whisenhunt? The New England Patriots fell to 1-1 for the 2012 NFL Regular Season after losing at home to the Arizona Cardinals in Week 2. The Cardinals escaped Foxboro with a two point victory after Stephen Gostkowski missed a late game-winning field goal. Considering that the Cardinals entered the game as the underdogs and were starting backup quarterback Kevin Kolb as John Skelton was sidelined with an ankle injury, the Patriots were justifiably 13.5 point favourites. Patriots fans were left to wonder while Gostkowski's kick sailed wide left of the goal-posts. Was it all on Gostkowski? A player who had kicked already kicked four successful field goals in the game. Was losing Aaron Hernandez early on too much? Hernandez's injury definitely hurt the Patriots, but considering the dearth of difference between each teams' respective level of talent, his loss alone shouldn't have been enough to decide the game. Maybe the Patriots were simply caught on a down day to the point that even Kevin Kolb could beat them? That one is a bit of a stretch. When you break the game down, the determining factor appears to emanate from the sidelines. Ken Whisenhunt's coaching staff appeared to better prepare his team and react to adjustments during the game better than Belichick and his crew did. It must be said that the loss of Hernandez drastically altered the Patriots offense. Without Hernandez, and with Wes Welker in a diminished role, the Patriots' matchup offense wasn't in effect. That meant that Tom Brady didn't have the benefit of dictating the defense's approach. Instead defensive coordinator Ray Horton was able to stick with his initial gameplan throughout all four quarters. Horton is a former Pittsburgh Steelers' secondary coach and used his experience in that area of the game to frustrate Brady with his approach. The Cardinals' defense had an obvious advantage over the Patriots' offense in the trenches. Therefore Horton was able to play both safeties Kerry Rhodes and Adrian Wilson deep on the majority of plays. Against cover two looks, the typical approach for the offense is to try and run the ball. The Patriots emphasized the run early on, but weren't able to capitalize on the defense's formation because of the overwhelming impact of the Cardinals' defensive front. Darnell Dockett and Calais Campbell in particular repeatedly shut down the Patriots inside rushing attack. Ridley did break a few runs outside for first downs, but his impact was limited to 71 yards on 18 carries with a long of 20. While the Patriots were able to control the clock, their explosion was hindered as the Cardinals secondary stuck to the Patriots' receivers. Because of the Cardinals' advantage upfront, they never had to risk giving up big plays and were able to play soft coverage repeatedly. The Cardinals sacked Brady four times and most of the team's early success in the passing game came from quick screens to the outside. The Patriots didn't use the screen pass enough to stretch the Cardinals' defense and slow down the pass rush. Instead they ran play action plays where the defense didn't need to worry about stopping the run and instead put consistent pressure on Brady. When Brady did get time in the pocket, the Cardinals combination of deep safeties and aggressive underneath coverage meant the Patriots couldn't unleash players like Brandon Lloyd and Rob Gronkowski. The only receiver who was consistently getting open for big gains before the fourth quarter was Wes Welker. Welker had two big receptions, one for 36 yards and another running a deep crossing route where he found space between the Patriots deep safeties and their underneath coverage. Welker wasn't heavily involved in the offense, but the Patriots would have benefited from adjusting their approach to get the ball to Welker's hands. When throwing in tight windows, it helps to have a shifty receiver with excellent hands to make catches under pressure. While Brady looked to Brandon Lloyd often, they misread each others' intentions on multiple occasions. The Patriots may have been rocked by the early loss of Hernandez and Tom Brady's early interception. Brady's interception was a result of a very impressive play by Darnell Dockett. Dockett understood that he couldn't get to Brady when blitzing up the middle. He instead detached himself from his blocker and occupied Brady's passing lane to Julian Edelman. Dockett tipped the ball in the air and it went straight to Patrick Peterson who made a very impressive one-handed catch. That turnover gave the Cardinals an instant field goal attempt, their second of the day after an impressive opening drive. Arizona Cardinals head coach Ken Whisenhunt is a former Super Bowl winning offensive coordinator with the Pittsburgh Steelers. Whisenhunt won the Super Bowl running an offense with then second-year quarterback Ben Roethlisberger. Despite Roethlisberger seriously struggling on the day, the Steelers scored with a long run and trick play touchdown pass from a receiver. This game was eerily familiar as Whisenhunt managed the game with his backup quarterback. A perfect opening drive that mixed a commitment to the run, safe passes to tight ends, screen passes, a throw off of play-action and a wildcat appearance from superstar cornerback/kick returner Patrick Peterson. This removed any pressure from Kolb and allowed him to settle into the game. Even though Kolb showed no ability, or even intent, to attack the Patriots' secondary down the field, the Patriots never adjusted their defense to force him to try and win the game opposed to simply managing the game. Bill Belichick may have been intimidated by the presence of Larry Fitzgerald, but once the Cardinals took a lead, after a blocked punt, the Patriots had to do something to force the game. When the Cardinals did block Zoltan Mesko's punt in the Patriots endzone, Whisenhunt still took caution with Kolb. After a stuffed run on first down, Kolb missed Fitzgerald on a fade route before throwing a successful screen to Andre Roberts. Neither throw ever gave the defense a chance of forcing the turnover. At that point the Cardinals were up by 13-9. When the Patriots offense couldn't get in scoring position to reply, the Cardinals added another touchdown with a methodical drive down the field from Kolb's unit. The same approach that led to a field goal on the first drive led to a Kevin Kolb five yard touchdown run in the third quarter. Despite a late surge from the Patriots, including big plays from Rob Gronkowski, the Patriots couldn't claw back the deficit and prevent the upset. Gostkowski will be the scape-goat, but Bill Belichick and his staff need to reassess how they approached the game in the first place. The relevant talent levels of each roster were not comparable.